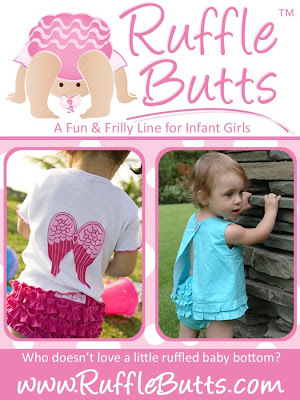 This has been an exciting week here at RuffleButts, as I have been in the interview process to add to our team! I have had the privilege of meeting some incredible women here in the Charlotte area. We are adding both an Intern position as well as a Part-time Office/Sales position, which will be such a fabulous step in the business. I never realized how tough the process would be though...I find myself wanting to hire almost everybody!! They all have such fantastic qualities, just all very different. With a few more interviews early next week, I am hoping to have someone officially hired by October 1st! With the baby coming in late November, time just seems to be flying by at this point. It's funny, it seems that the first 6 months or so go by pretty slowly...you start to feel like you've been prego forever, but now that I am into the 3rd trimester, it seems to be going by at light-speed!! Maybe it's just because I feel like I have so much to do before she gets here. 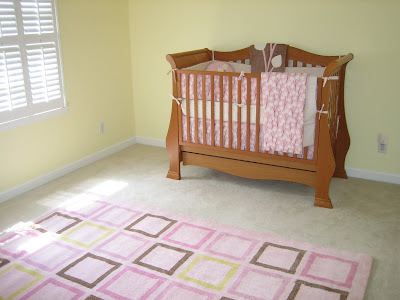 Which by the way, I have to brag about my super sweet husband...when I arrived home following my trip back home for my grandfather, I came home to find that Mark had surprised me with a painted nursery and put-together crib!! I must say that it is such a nice feeling to at least have the room painted and ready for furniture. We already have the bedding (which was a very thoughtful gift from my mom), and he even put that all together!! The room is looking a little empty at the moment, but I am working on the decor and furniture here over the next week or two. Lastly, on a different note, I want to thank all of you that have taken the time to give me your input on our big fabric dilema. I think we are going to try a new wash on our fabric with natural enzymes in order to keep it 100% cotton, but to soften it a bit, preventing wrinkles and shriveling after being washed. It is such a tough decision, because it would be easier to just go with a poly/cotton blend, but it is important to me to try to stay 100% cotton, which is more natural and just a nicer fabric. I am trying so hard to get rid of those darn wrinkles, so maybe this is a perfect solution. We are doing some testing now and should have samples here in the next few weeks. I happened to be over at a friend's house last night and she mentioned that she had just received her new Cookie Magazine in the mail that day...so, I turned to the back advertising section, and was super excited to see RuffleButts staring back at me!! If you are a subscriber to this really great new magazine, be sure to check out your October issue! As a small business, it is always so difficult to make advertising decisions, as I truly never had any idea how expensive advertising can really be. Throughout this first year of sales, our advertising budget has been next to nothing, but we are now just at the point where we have received a great response to our product, and need to let more people know that we exist. I made the decision a few months back to try a run with Cookie Magazine, being that this seemed to be the best fit for our company. I would also love to advertise with babytalk or American Baby, but we simply can not afford to do so. October is our very first advertising issue with Cookie, and although we had to use old pictures since our new ones hadn't arrived by the ad deadline, I think it turned out pretty well for the 1st go around. We also ran an ad in this month's Baby Couture magazine, but I don't believe that one has hit newsstands just quite yet. CLICK HERE TO VIEW THE NEW RUFFLEBUTTS FALL 2008 FASHION SLIDE SHOW! I am so excited to share our new Fall Slide Show!! As I mentioned earlier, we started working with the most fabulous photographer out in CA and I am just thrilled with this first round of photos. If you are a store owner in need of a professional photographer, I highly recommend Amanda Elkins Photography. She has managed everything for me long-distance, and I truly can not speak highly enough of my pleasant experience with her! I will write more about this experience at a later date, but in the meantime, I would love to share with you our new and improved Fall Fashion Show! !